+ Propaganda should appeal to the heart, not the intellect. + It should be understandable by the least educated members of society. + It should contain one central message, to be repeated over and over. + Pictures and drawings, even crude sketches, speak louder than words, and the fewer words the better. + The views of the opposition should be denounced categorically, never entertained. + A big lie is more effective than several small ones. Even once exposed, it still carries a ‘force of credibility’, a lingering doubt that at least some aspect of it might still be true. + Accuse your opponents of what you yourself are doing. + Focus should be kept on fighting a single enemy; all other enemies should be linked with a single great one. + Face-to-face meetings with the public are the most effective way to promote a political agenda. + A political campaign should be led by one charismatic figure with strong, inflexible convictions. Each of these rules is discussed at length in “Mein Kampf”, published in 1925. Hitler claims no originality for them, crediting instead the Communist Party, the Catholic Church, the “Jewish Press”, and the British propaganda office during World War I. 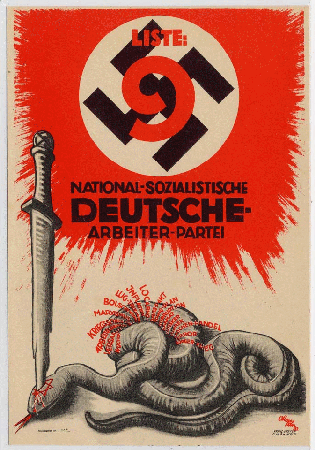 Whatever their source, they served as guidelines for the entire National Socialist propaganda effort. + Dominate the communications media to marginalize any opposing view. + Enlist celebrities, authorities, and trusted group leaders, who control the opinions of their followers. + Actively create circumstances that engage the public by dramatizing issues, personalities, and events, sometimes by highlighting a particularly compelling detail. + Psychological insights, especially Freud’s, should be integrated into any propaganda campaign. + People will always need food and shelter, crave entertainment and community, be influenced by fashion and style, and respond to strong leadership, and will always be receptive to propaganda appealing to these basic interests. Between 1930 and 1945, Germany created the most effective propaganda the world has ever seen. Its artistry, design, emotional appeal, use of mass media, and sheer volume sets it apart from all other such efforts, before or since. Antisemitism was a central theme. The Jews were the enemy that the German public was united to fight against.